From April 1990: the first issue of British magazine COMICS INTERNATIONAL. This doesn't boast of being the launch issue anywhere on the cover and - I must confess - I only realised it was when reading a retrospective on issues-to-date in the 50th edition. I imagine editor/ publisher Dez Skinn (him again) was trying to create an impression of immediate longevity. The thought process behind CI is that it was to serve as the BROADCAST, VARIETY or HOLLYWOOD REPORTER for the comics industry: a news bible for both insiders and the fan. This was, of course, pretty much pre-internet when almost any trade or industry of any note had some form of news chronicle. This was initially a freebie placed (in my experience) next to the tills in comic stores with the intention that readers grab a copy with their weekly stack of purchases. Costs were, of course, bankrolled by the many stores and dealers (far less so actual publishers) advertising inside. However, its status as a giveaway didn't last long and within a few issues a small cover price was slapped on each copy. But print runs continued to rise, buoyed by the industry boom. By luck or judgement, CI launched at just the right moment. The industry boom was just about to go into overdrive and - at the very least - there would be no shortage of new product to write about. 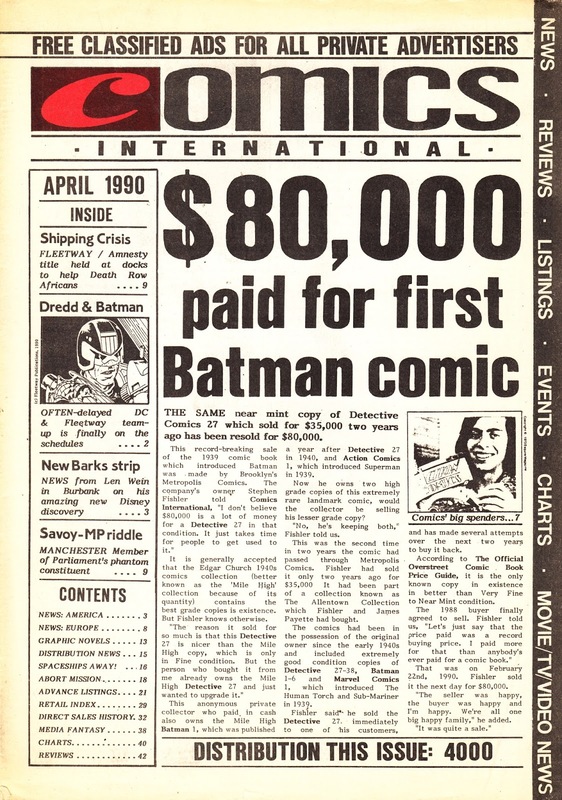 The boom was fuelled by newcomers attracted to the prospect that comics could become a valuable commodity but little actual knowledge of the industry or the output. The boom in buyers, and back issue investors, also boosted the number of comic book stores which jacked up the number of outlets carrying the magazine and the number of advertisers. As I've posted in the past, there was also an awful lot of marts and fairs (pre EBay) taking place around the country. All of which needed publicity. Great timing. CI predates WIZARD and the host of other wannabes that flooded into the marketplace in the early nineties. It also saw off its nearest UK competitor COMICS SPECULATOR NEWS. Its news-based agenda made it a nice compliment to the more features-based COMICS COLECTOR/ WORLD. At some point CI apparently secured distribution through the newstrade but I don't recall ever seeing a copy in a newsagents which suggests that distribution was far from mainstream. It survived the industry collapse mid decade and continued to report of the convulsions that shook the business. It faired less well as the Internet became the principle means of disseminating news, reviewing titles, sharing gossip and debating whatever. It tried to adjust by adding more feature and retrospectives which did - once again - make It an essential purchase. Dez, who published under his long standing Quality Comics banner, sold out in 2006 and fandom mainstay Mike Conroy took the helm. However, the gap between issues began to expend and it was not uncommon to find that the contents - even the adverts - were out of date by the time the issue hit stores. Articles on the comics histories of DOCTOR WHO and GERRY ANDERSON's shows were highlights. CI bowed out with two excellent specials devoted to horror comics and a (near) complete history of STAR TREK comics. The latter is well worth tacking down.